The first webinar in the Giving Australia 2016 series, Philanthropy and philanthropists was held recently. Many thanks to Prof Jo Barraket, Dr Christopher Baker for presenting and to Angela Perry and Assoc Prof Wendy Scaife for facilitating. 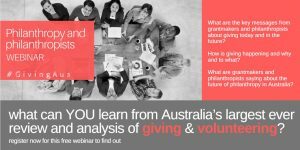 The webinar included key messages from grantmakers and philanthropists about giving today and in the future, how giving is happening and why and to what, and what grantmakers and philanthropists are saying about the future of philanthropy in Australia. Thank you to all those who attended the webinar. CLICK HERE to download a recording of the webinar. Click Reply to tell us your thoughts on the information presented / questions for researchers / ways we can improve the webinar experience / any other feedback. TODAY’S WEBINAR – Have you registered yet?? It’s not too late to register for today’s webinar, Philanthropy and Philanthropists. Be one of the first in the country to hear this cutting-edge data from Giving Australia, Australia’s largest ever review and analysis of giving and volunteering.